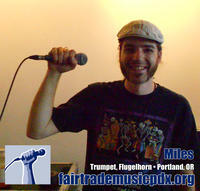 Making Fair Trade Music a reality is a massive, group effort. The challenges in reversing the effects of thirty years of systematic devaluation of music and musicians are substantial. As musicians, we're all involved, and there is no middle ground, no neutral territory. We can choose to be part of the problem or part of the solution. The good news is, if we all pitch in, even a little, we can win the profession back. the current system will probably eradicate the profession before long. Otherwise, you'd better do something. Soon! Missions are simple, concrete ways to help; Many can be done in under five minutes.